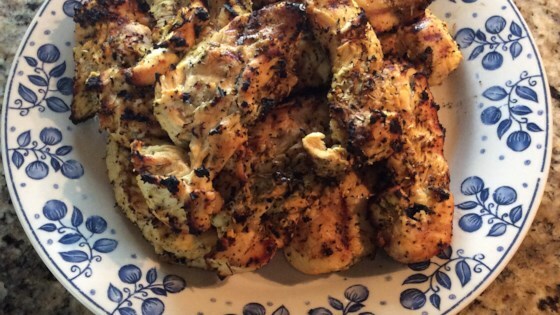 "This lemony marinade is great for grilled chicken." In a small bowl, mix lemon pepper, dry mustard and crushed dried rosemary. Place chicken breast halves in a medium bowl. Rub with garlic. Introduce the lemon pepper mixture and rub it into the chicken. Pour in lemon juice and dry white wine. Cover and refrigerate at least 3 hours before grilling. Cook marinated chicken breasts on the prepared grill until meat is no longer pink and juices run clear, or to desired doneness. A zesty marinade for grilled chicken breasts. Dinner’s ready in minutes. loved this recipe! made it as a freezer meal (marinade and chicken breasts in a freezer bag and tossed in the freezer) - delicious! Great, indeed! I ended up using sherry in place of the wine, and a bit less lemon juice. Marinated it overnight. Very good, thanks Brian! !